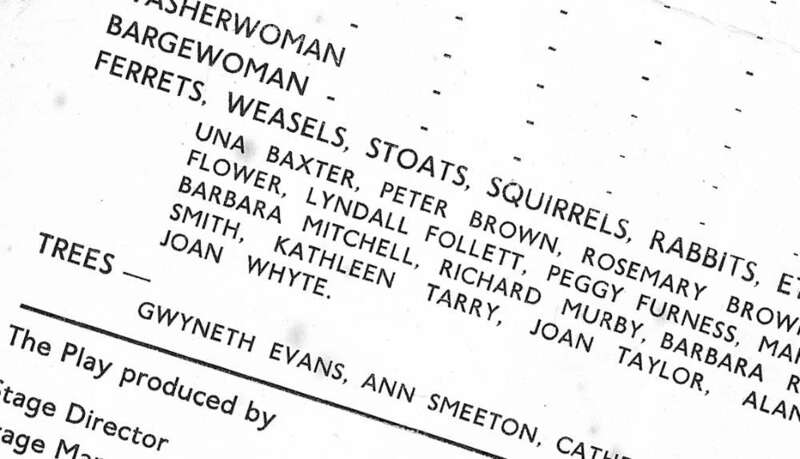 Kenneth Grahame, the author of The Wind in the Willows from which the play has been adapted, was a born story-teller. There are countless admirers of his other classic books, The Golden Age and its sequel Dream Days which includes The Reluctant Dragon translated to the screen by Walt Disney. The adventures of the irrepressible Mr. Toad and his gay companions known as the River-Bankers in their clash with his sprightly enemies, the Wild-Wooders, made their first appearance in bedtime stories told by the author to his small son. Later, when the boy went on holiday, they were continued in letters, which, years after in 1908, formed the basis of the immortal book. 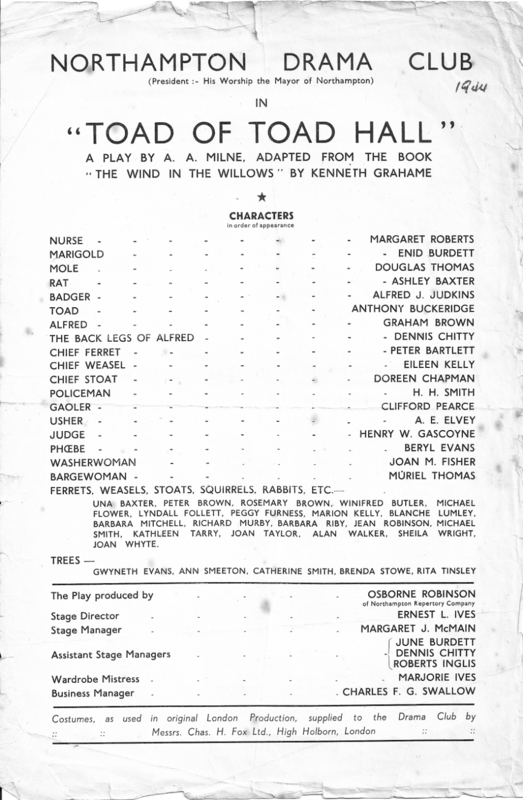 ln the original production at the Liverpool Repertory Theatre on 21st December, 1929, Nova Pilbeam appeared as Marigold, Frederick Burtwell as Toad, Richard Goolden' as Mole, Tom Reynolds as the Judge and Wendy Toye as Phoebe. Then and in the several London Productions, it was received with acclamation. And no wonder, since it is a novel, genial and lively play with a universal appeal. The Northampton Drama Club has blazed an adventurous trail since its inception. lts object to foster and encourage a vital and informed interest in the drama by creative work has been consistently maintained. Variety has been the keynote. lts internal programme has numerous and diverse features and its public presentations cover the whole gamut of the drama ranging from the classic plays of the master-playwrights to light, frothy revues. Prior to the outbreak of the war, the Club had its own premises which included a small, well-equipped theatre and was the focal point of the principal dramatic societies of the town. Despite the large number of members in the Forces and other war-time difficulties, the Club has suceeded in keeping the flag of drama flying high.